Sometimes I wonder what life was like before magic burst into existence, before the Magical War of 810 destroyed our world. What it was like before there were Wyrd Blood, or we were forced into hiding. And that's what I've been doing for years, hiding me and my crew. But that's about to end. My crew is starving and things are getting dire. When I get desperate enough to try and steal from Ryker, one of the toughest men in these parts, things go bad and my Wyrd Blood origins are outed. But it's not all bad. Ryker can help keep me alive from the mysterious illness that's been plaguing me. He can also feed my crew. The only thing I have to do in return is start another war. The Magical War of 810 destroyed the world and started a bid for power. 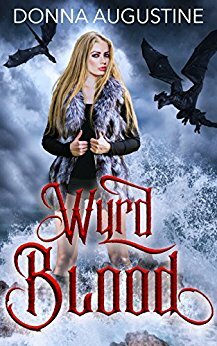 People with magic had Wyrd Blood and were hunted to either indenture the person into a high-powered person’s service or killed to gain their power neither being a way to live your life. Bugs has been hiding since she was 7 and runs a small crew. They depend on her to feed and keep them safe and times are getting extremely tough. Bugs decides the only way to help her crew it to steal from Ryker but things go badly and she’s outed as a Wryd Blood. Bugs has to decide if making a deal with Ryker is the best way to keep her crew alive as well as herself. In a world where people in power are greedy and selfish, this story makes you think about the troubles in society where different castes of people struggle while others do not. Even though I like to live in fantasy through books sometimes it is nice to see that even in a fantasy world it relates to reality. Augustine always delivers a new and exciting story that is an easy read and you do not want to miss this one!